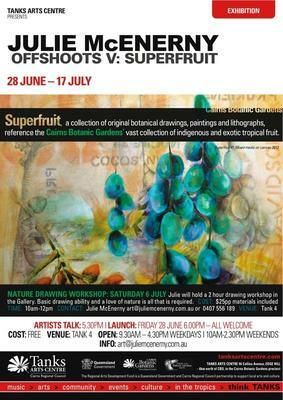 'Offshoots 5: Superfruit', an exhibition of original botanical drawings, paintings and lithographs, references the Cairns Botanic Gardens’ vast collection of indigenous and exotic tropical fruit. Julie combines traditional illustration with other media, and in drawing on an artistic past in commercial art, alludes to the marketing of superfruits, bringing some undervalued counterparts into the spotlight. Offshoots, now in its fifth year, began with a residency at Tanks Arts Centre and Cairns Botanic Gardens in 2009. Botanical drawings form the basis of the Offshoots series and go toward a growing body of work documenting the plants of Cairns Botanic Gardens. The Superfruit exhibition is complemented by an interpretive display and weekly presentations at the Botanic Gardens Visitors Centre. Julie will be conducting a ‘Nature Drawing’ workshop at the exhibition Sat 6 July. The Nature Drawing Workshop will be held at Tanks Arts Centre, either in Tank 4 or just outside under the trees. Julie will demonstrate using watercolour pencils and provide participants with good quality watercolour paper and pencils to use, all included in the price. A basic drawing ability is an advantage but all levels of experience are welcome. Numbers are limited so please book to avoid disappointment. Julie also holds Botanical Drawing classes at Cairns Botanic Gardens. 'Offshoots 5: Superfruit' was funded by RADF. The Regional Arts Development Fund, through Arts Queensland, is a Queensland Government and Cairns Regional Council partnership to support local arts and culture.